BlackBerry 9900 Pluto spotted? | BlackBerry Blast! BlackBerry Blast! > News > BlackBerry 9900 Pluto spotted? Wouldn't it be great to have a touch screen BlackBerry with a thumb keyboard? Just look at the BlackBerry 9900 Pluto. 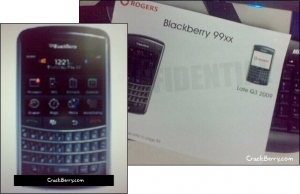 Recently leaked documents from Rogers indicate a BlackBerry Bold style device with a touch screen is on the way. Currently codenamed "Pluto" this device is rumored to be coming to Rogers in Q3 or Q4. After CrackBerry posted the photos of the leaked docs they were challenged by BGR. The consensus seems to be that this was either a photoshop job, or simply an old project that was scrapped internally at RIM.